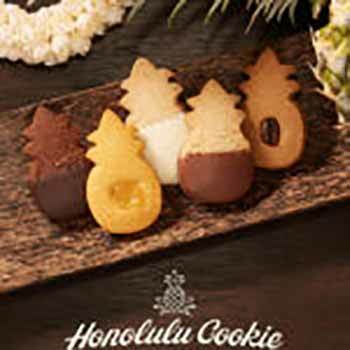 Honolulu Cookie Company has delicious, Hawaiian shortbread cookies. One FREE Cookie per person, per visit, per day. The Honolulu Cookie Company brings the spirit of Hawaii to the Las Vegas Strip with their delicious hand-dipped shortbread cookies. Using the freshest ingredients and baked daily, each cookie is like a work of art. Using Guittard chocolate, these Hawaiian favorites are a beloved dessert of the finest quality and taste. Every cookie is hand wrapped with their signature style, bringing the Aloha spirit to the mainland. Packed with the deliciousness of the original flavors of Hawaii, The Honolulu Cookie Company offers individually wrapped cookies and gift boxes that make a great gift. Try the beloved flavored cookies like the Butter Macadamia, the Chocolate Chip Macadamia, the Passion Fruit, the Guava and the classic Kona Coffee.